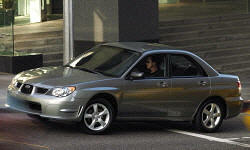 See TSBs and recalls for the 2006 Subaru Impreza / WRX / Outback Sport. Chart based on 136 repair trips. The repair cost chart excludes repairs made under warranty, do-it-yourself repairs, and repair trips that include maintenance. R 8000 Radiator hose also perished. R 15000 Car still breathing oil from vent. Vent routed to ground. 22000 mi Threw a P0422 CEL. I couldn't find anything so I reset it but it kept coming back so it went to the dealer. They couldn't find anything either so they did a full diagnostic and reset it. Hasn't come on again. US $1030 Both fuel cut valves in the gas tank cracked due to age and turned on P0442 CEL. It did not affect drivability. This is a labor intensive repair - 86% of the cost was labor. US $200 One of the o-rings had gone bad causing leaking of AC charge. Part was replaced and system was recharged. US $75 Battery losing charge. Replaced. Died again when car left alone. Still unsure of cause of power drain. 49000 mi Three 8mm bolts on cam gear that secures on a plate came loose. The plate is part of the variable valve timing system which uses oil pressure to control the timing so as the bolts came loose oil was leaking past the plate. US $300 Intake pipe developed a vaccum leak from a rip that went about halfway around it where it attaches 2 the turbo. Replaced the oem plastic pipe with an aftermarket metal one which was a mistake because the fitment was horrible. 64700 mi Turbocharger had an external oil leak on a non-serviceable seal and also a whine associated with the part failing internally. Replaced turbocharger to correct the concern. US $200 Radiator blew at 103,000 miles. Could drive home but definitely needed a replacement. US $108 Lower radiator return hose clamp got loose and started leaking coolant. Replaced both upper and lower radiator hoses. Should have replaced them when I replaced the radiator 10k miles ago. US $1200 A/C compressor needed replacement and the condenser was damaged by a stone. US $289 Alternator bracket cracked, replaced with parts I bought online from other subaru dealer Than one visited for repair and labor charged. C $50 Emissions air pump valve had failed from corrosion. Replaced with block-off plate, tune updated to ignore resulting emissions codes. US $65 CEL at 42,856. Mechanic says OBD - fuel cap loose. Mechanic tightened fuel cap, problem went away. US $147 Timing belt snapped from age. Battery dead. US $400 Mechanic found transmission leak. Blown fuse caused the power mirrors to stop working. US $1146 Replaced 2 IMR control valve. Repaired cose P2009. Intake Manifold Running control circuits low both banks. US $430 Front CV boots cracked and leaking. Replaced prior to CV failure. 85000 mi Air pump solenoid failed. System disabled, car passes emissions fine without it. Common WRX problem. US $2000 Clutch and flywheel replacement. The lining wore out. Engagement was getting higher/harder to achieve smooth transitions, and was replaced prior to failing. Car gave plenty of warning to the end of life for the clutch. US $900 A valve in the air intake system failed. US $450 Replaced both (left & right) front axle boots. US $100 Leaks in A/C system. Replaced seal & recharged. Power steering pump was whining. Replaced fluid eliminated whining. Right rear wheel bearing had to be replaced. Bolts holding in place were frozen and head snapped off -- had to be heated to break loosed. Heating up required replacing several bushings in additional to replacing bolt & wheel bearing. 3300 mi Replaced outside temperature sensor under warranty. US $85 Inner Right CV Boot cracked - due to turbo heat. Replaced BOTH axles to be safe. US $1050 Clutch, pressure plate, engine rear oil seal (possibly seeping a little), throwout bearing, clutch fork and pivot. US $100 In for 90k service with clutch replace. Trans snout worn - tech installed "Speedy Sleeve" and new throw out bearing. In for 90k service with clutch replace. Found shift shaft seal leaking - replaced. In for 90k service with clutch replace. Found left/front inner CV boot leaking - replaced boot. US $300 Turbo wastegate was not moving freely, boost was not being controlled properly. Sometimes overboosting and sometimes under boosting. Replaced turbo exhaust housing from a used turbo. US $145 Noisy front left wheel bearing. Replaced wheel bearing. Front right inner axle boot leaking grease. Replaced grease, boot and clip. US $100 CEL due to stuck air valve. Air pump also noisy. Replaced air pump and air valve with used parts. Old valve was badly corroded and full of water. US $150 Crack in radiator causing coolant loss. Radiator replaced. US $380 The driver's side secondary air combi valve failed in the open position. As a result exhaust was leaking via the air pump, and the CEL light came on. The part was $380 retail from Subaru. I did the troubleshooting, servicing and mechanical work myself. US $201 Leaky radiator hose led to coolant levels being too low to circulate. US $120 Power steering pump seized Ac compressor clutch became unable to stay engaged. No need to fix given time of year. US $1100 Replaced clutch, release bearing wore out. Then had to bring the car back the next week because they did not firmly attach the prop-shaft hangers (thus the 2 days). They did not charge for the second repair, as it was their fault. Mar 2014 Head gasket went. Extracted engine myself, had heads rebuilt. Update: later discovered it was just a very hard to locate hose was spraying coolant. I took the opportunity to do a rebuild regardless. Replaced the AC compressor with one I bought for $100 from the junkyard myself. US $6000 Cost 6k all in for labor to reassemble the drivetrain and replace the short block (cylinder walls were corroded by coolant from head gasket failure). Had I not tried to fix it myself it would've been more like $3,500. 56000 mi Loud clock spring that dealer quoted $300 to replace. Forget it. 58000 mi Loud clock spring when sold. 8060 mi First and second gear teeth were damaged so that the transmission would not shift into either gear. Dealership said it was caused by abuse and therefore would not cover it under warranty. Subaru has an issue with their transimssions that they won't admit Driveshaft hanger bracket was installed incorrectly and is now hitting the exhaust. US $400 Leak in high pressure side of A/C. O-rings and high side hose replaced. System refilled with refrigerant and oil to OEM spec. US $425 Heard warbling noise (wom-wom-wom) at speed. Suspected wheel bearings. Shop replaced front wheel bearings, which did reduce some noise while turning, but did not fix the initial problem. US $25 Had both front wheel bearings re-replaced, since original replacements failed during January. Now, a week later, noise is back. Suspect hubs. Will return to shop this month. US $1000 Wheel bearings were still making noise. Brought car to different shop, replaced front bearings + hubs, problem solved. Front-right tie rod end was leaking grease, causing loose steering. Replaced part, steering tightness restored. US $3000 Cylinder #2 intake valve sleeve caused valve to be sticky in closing and thus causing damage to other valves in cylinder - bent one, caused valve seat insert to be dislodged slightly. Misfire CEL, low compression and leak-down. C $1000 Replace front calipers. Exhaust replacement. US $235 Replace leaking valve cover gaskets. US $40 Check engine light came on, then cleared itself after 1 day. Shop determined error code was "no start condition". Problem has not reappeared. US $10 Clip holding the throw-out bearing snapped and cause bearing to rub on pressure plate in clutch. Full clutch failure in 4 days. Had to purchase a new clutch kit, throw-out bearing clips and gasket for exhaust. Took about 8 hours to replace. Replaced driver side headlight. US $500 Cylinders random misfire due to old and corroding parts. Changed spark plugs, wiring, and coil packs. US $240 Miss fire in Cylinder 1. New plugs and wires as well as a new Main Drive Belt to stop the squealing. Feb 2008 Replacement of Driver side power window motor. 148780 mi Cleaned throttle body. The car wasn't idling correctly and kept setting off the check engine light with low idle codes, and cleaning that fixed it. US $350 Passenger side Wheel bearing was making a rumbling noise. I had the wheel bearing and all of the seals replaced. US $40 Replaced both power steering reservoir hoses, they had become old and hardened. 44640 mi Blinking check engine light. They could never replicate it nor found it from ECU. It goes on usually after cold start; then went away after 5 to 10 mins of slow driving. C $900 Replaced all the wiring. Car kept stalling and wires were brittle. Oil pan rusted through. Replaced pan. 23000 mi valve timing sensor replaced. Jan 2012 Adjust frameless windows to reduce wind noise. Used subaru forums to get basic understanding of adjustment. Partially successful, but not entirely. 71000 mi Slight seepage around head gaskets. Not fixed yet. Left inner axle boot seeping at outer clamp. Not fixed yet. US $50 Broken wheel stud on right rear corner, replaced. Wheel felt funny, found they were all loose, one snapped off when tightened. US $2800 Replace head gaskets, resurface heads Clutch shudder, flywheel surface worn prematurely. clutch still had 50% life. Clutch and flywheel replaced. US $63 Overheat at sustained high speed, cooling escaping. Replaced Radiator, thermostat, and cap. Broken Wheel Stud replaced. 12000 mi Minor hesitation off idle solved with ECU (engine computer) software update. US $150 Shifter was extremely stiff/slow when cold (manual transmission). Difficult to shift into reverse. Lubed and adjusted shift linkage, replaced transmission oil with synthetic. Problem resolved. 86000 mi Diagnose rattle/resonance from rear of car at 65 mph. Noise traced to very rusty, loose exhaust system. Driveability/reliability not affected. Elected to replace at later date. Was not charged for diagnosis. 102300 mi Attempt to locate rattle under car. Unable to locate and not charged. US $50 Diagnose exhaust rattle. Located broken weld. Referred to other shop with welding capability. Welded exhaust to fix rattle. Was diagnosed but not repaired by dealership. US $200 Shifter became immobile and engine would stall whenever clutch was released. Flatbed towed to dealership. Problem could not be duplicated once the car was at the dealer. Still unresolved. US $600 Replace both front inner CV boots. Diagnose multiple odd noises. Whistling/squealing diagnosed as pinhole exhaust leak. Noise from bell housing diagnosed as failing throwout bearing. 112000 mi Follow up from previous visit (noise from throwout bearing). Removed transmission and installed clutch kit. Also discovered leaking transmission seal inside bell housing. Approximately one week after previous repair, car began shaking violently upon clutch engagement. Returned to dealer, problem diagnosed as defective replacement clutch. Repaired free of charge. US $132 Tailgate latch failed. Unable to open tailgate. Replaced exterior handle. US $250 Replace muffler and other exhaust components to address previously diagnosed exhaust leak. 125000 mi Little to no assist from power steering immediately after cold start on days below freezing. Also noticed excessive whine from power steering pump. Shop unable to duplicate problem (warmer day). Elected not to pay for further teardown. US $200 ABS light on. Multiple whees speed sensor codes. Tried cleaning sensors and connections. Unable to resolve problem. C $450 Blower motor failed. Cannot just swap out the motor so I had to replace the entire Blower assembly. 67300 mi One rear strut leaking; recommend replacing both and rebalance. Not addressing right now; may replace this car in early 2015. 72000 mi Car used oil between oil change intervals from the beginning. Sometimes the oil got lower than it should have before owner added oil. Piston rod bearing eventually deteriorated and a new short block was recommended. US $600 Ignition coil cracked at wire connections. Replaced coil wires and plugs. 141000 mi The car needed two quarts of oil on our trip to South Carolina- approximately 1400 miles round trip. We thought we saw an oil leakage. The shop couldn't determine the cause, saw no evidence either. Was told the headgasket was leaking oil. 149400 mi Headlight bulb. Very difficult to access, but at least it wasn't the headlamp on the driver's side which requires one to take out the battery. US $1200 I had a leaking head gasket on the passenger side. Had both replaced. They also replaced the timing belt and kit (?). Radiator hoses replaced. Also, o -rings on oil dipstick (?). Had to take it back for this a week later. No charge. US $800 The front catalytic converter was replaced. My check engine light had been going on and off for well over two years. I finally decided to get the repairs done. US $500 One rear strut was leaking. Both struts were replaced. I noticed a noise in the rear. It was the heat shield above the muffler rattling around. The mechanic removed it and said I could replace it if I wanted to at a later time. He also found a rusted hole in the center pipe, so the pipe and the muffler were replaced with aftermarket parts. C $300 Replaced all 4 wheels brake pads and front rotors Wheel bearing noise from rear of car, Replaced both rear wheel bearings and seals. CEL was On and fault code indicated O2 sensor before cat., replaced sensor and checked connections and took voltage readings. All checked out ok but CEL came back, am stumped. US $400 Needed new throttle body. Transmission gasket failure, leaking fluid. C $420 Left rear wheel bearing worn/failed - replaced. US $200 Bad rear end bearing. Rebuilt the rear-end. Throttle body dirty, causing check engine light to engage. $115 to diagnose and $85 to spend 15 min. cleaning the part. See our lemon odds and nada odds page to see vehicles with no repairs or vehicles with more than three repairs. 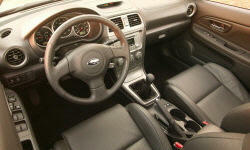 To see how frequently 2006 Subaru Impreza / WRX / Outback Sport problems occur, check out our car reliability stats.